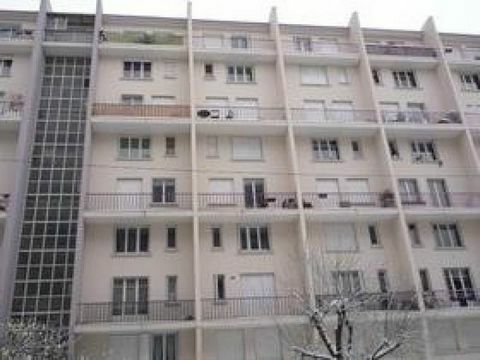 Grenoble Your average person on the street would say that sitting in a meeting for a couple of hours conducted in a foreign language with only occasional translation would be right there on the list with watching paint dry, but they would be wrong. For perhaps the fourth time in the last two years I was a guest at the local board meeting of the Alliance Citoyennne, ACORN’s affiliate in Grenoble, and, as always, it was a pleasure. As a leader said during our meetings in Paris earlier, “Grenoble is the Little Rock of France,” meaning that just as Little Rock was the founding city of ACORN, so does Grenoble have the pride of place in starting the Alliance on its successful path. 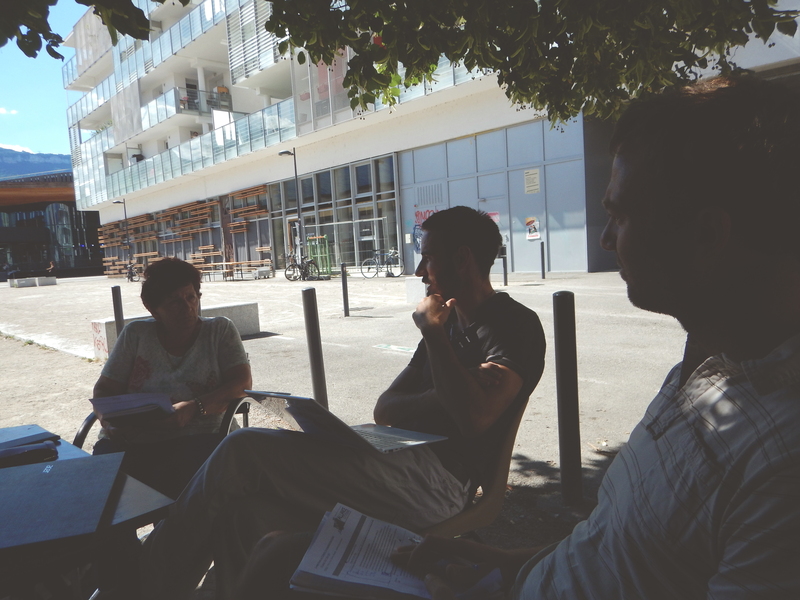 It was hot in Grenoble and though the office has small fans propped on many a desk, and none of the humidity of New Orleans, making it all still highly tolerable, meetings quickly move to the shade of the trees in front of the coop offices. A card table holds the papers, and chairs are clustered around. I enjoyed the fact that when I sat down, I knew everyone of the board members now from my last visit, so it was like seeing old friends. Even the one member who missed his train, was well known to me. Rather than stumbling through the cheek kissing greeting of France, I could appreciate the good will of greeting people again. It was cool in the shade and there was a steady breeze, so who could complain? The agenda before the board was difficult. There had been a hard slough of conflict with mistakes made and tough lessons learned throughout the last year. Some leaders had left. There had been difficult staff transitions. The mere fact of conflict itself had been trying on everyone. I could repeat how natural and normal this was in a new organization’s life a million times, and that would not have made anyone feel any better. The board had grown though. These were now veteran leaders well used to each other and prepared to lead. The board had also completed the transition to a governance structure that was almost completely composed of members elected from the local group membership which also made a difference. 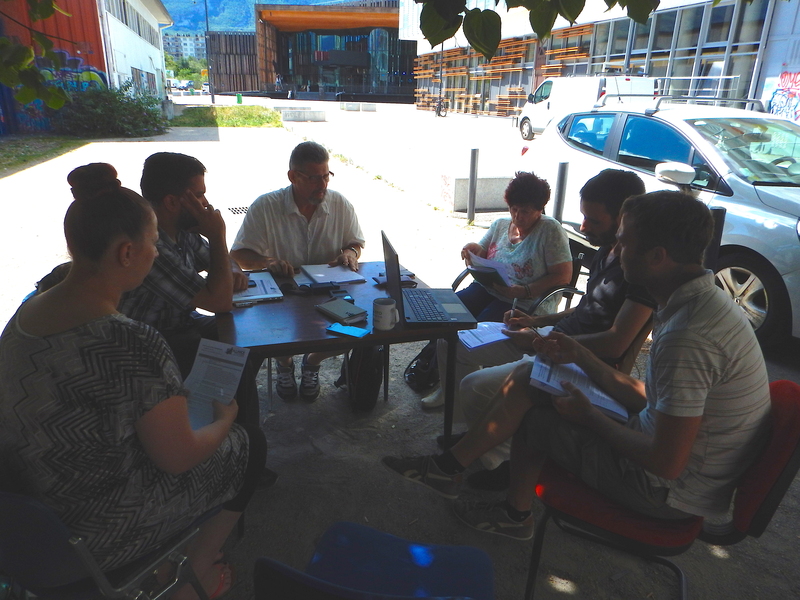 The hardest issue the board tackled was how to deal with the decision around a new head organizer for the Grenoble organization. They had a strong 3-person staff, but that almost made the process more difficult, wanting to both keep everyone on the team, but also pick a leader of the team. Any decision would set an important precedent throughout the organization about how much the leadership wanted to manage and direct the process, and once in, would there ever be a way out? There was a lot of discussion back and forth and various proposals, including individual interviews with each organizer. The added difficulty had been the fact that the staff had proposed a candidate in recent weeks, but the board had not come to consensus around the candidate. Finally, the board directed that the overall Alliance head organizer needed to meet with the staff and essentially, work it out, and come to agreement with the staff and then make a recommendation that the board could either accept or reject, while protecting its position to determine policy. It was the right decision. Talking about the future, they planned a discussion on an exciting campaign to run their members and leaders to the government boards of all of the public housing projects where they had strength. The elections are held every four years and the next is in 2018. This is the area where leadership that has been developed in these kinds of struggles can shine. I was enthusiastic. 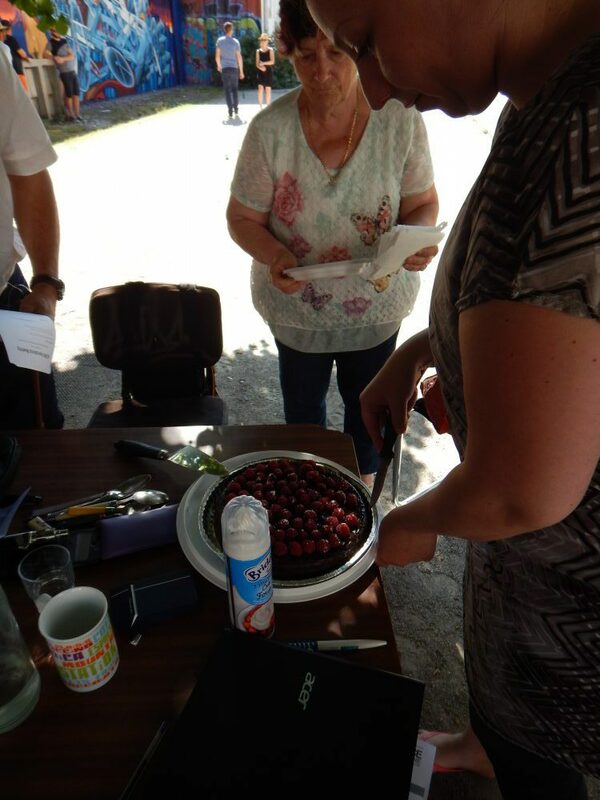 The meeting ended on a high note, and, this being France and Grenoble, and this great group of leaders, then we ate homemade chocolate cake with raspberries and whipping cream on top! C’est bon!